Online shopping continues to grow in popularity, reflecting consumers' overall satisfaction with the ecommerce experience. Still, problems can sometimes arise. 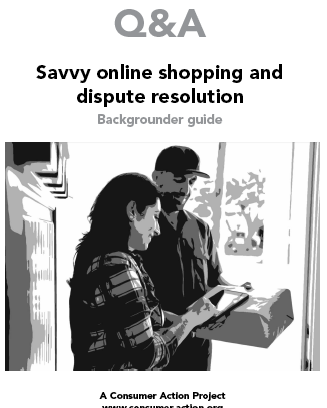 This backgrounder helps answer many questions consumers may have about shopping online safely, avoiding problems, dealing with customer service issues and resolving disputes. What kinds of passwords are strongest? Your passwords should contain at least eight characters and be a random mix of letters, numbers and symbols. You can use an online tool such as PasswordsGenerator.net for help coming up with one. Consider using a passphrase—a longer version of the password (for example, ilikecookies&milk). Use different passwords for your different accounts. Online tools can help you store your passwords without writing them down. (PCMag offers a list of "The Best Password Managers of 2016.") Change your passwords as often as needed to stay safe. If asked to set up security questions (used in case you forget your password), choose ones that nobody else is likely to know the answers to. Don't share your passwords and logins. If a website offers two-factor authentication (2FA), enable it. It's stronger than a password alone because it requires two pieces of information to access the account (for example, a password and confirmation of an onscreen picture/graphic you've chosen, or a password plus a passcode that is sent to you via text message or email). Log out of accounts whenever you are finished, and, if you share a computer or device with others, don't let your browser save login information. How do I make sure the shopping or payment app I download is legitimate? To reduce the chances of exposing yourself to data-stealing malware, don't download anything that isn't offered through a trusted source (the Apple App Store or Google Play, for example, or the legitimate site of a trusted store, credit card company or other business). There's no guarantee that an app is okay, even from the app stores, so always be on guard. McAfee and How-To Geek offer tips for avoiding bad ones. Once you have downloaded an app, be diligent about updating it so that you always have the newest version available, since updates often contain security improvements. Is it safe to send payment information by email? Email is not safe for relaying personal data or payment information because messages aren't automatically encrypted. There are some tools that enable you to encrypt your emails, but this is more trouble than most consumers are willing to go to, and shouldn't be required to shop safely with a merchant. Should I allow my browser or app to save my payment information for convenience? It's never a good idea to allow your payment information to be saved. This could put your personal and payment data in jeopardy if there were ever a breach of the merchant's database. Even though it might be a minor inconvenience, it is safer to re-enter your payment information for each transaction. Can I judge a merchant by its website? A fancy website doesn't make a business legitimate or trustworthy, yet a website that looks unprofessional (low-res images, typos, etc.) should immediately raise a red flag. Regardless of the quality of the website, if you're not familiar with a merchant's reputation, check its authenticity, customer satisfaction ratings and complaint history through an online search. Verify information and claims (for example, call the phone number listed). The absence of a legitimate (or any) address and a working phone number should be cause for concern. While scammers can create fake reviews as easily as they can a fake website, a large number of positive reviews on trusted, established review sites are a positive sign. What kind of return/refund policy should I look for? Many retailers allow returns if you change your mind or receive an unwanted gift, but they aren't legally required to do so, so some don't (i.e., all sales are final). Likewise, some retailers allow returns, but only within a short timeframe, and/or they might give only store credit—no refunds. Some pay for shipping on exchanged items but not on returned items, and some don't ever pay shipping. Unless a purchase is under warranty (express or implied), in most cases your ability to make an exchange or get a refund depends on the merchant's policies. Clarity and availability: Is the policy explained in detail, easy to understand and easy to find on the website? Tone: Does the merchant appear to be focused on consumer satisfaction, or just on making the sale? Leniency: Are you entitled to a refund, an exchange or nothing (all sales are final)? What is the window of time for returns? Who is responsible for return or exchange shipping? If the consumer, is it a reasonable cost? Is there a restocking fee? How long does the process take from return to refund/credit? Convenience: How easy is it to make a return/exchange? Does the merchant provide a prepaid return label? Do you have to get preapproval from the merchant before sending back the item? Are there any laws that entitle me to a refund? There's no federal law that requires a merchant to refund money—the policy around refunds is up to the merchant, providing it meets minimum state legal requirements. The exception is in the case of an express or implied warranty. Generally speaking, if a product you've purchased is unfit for the purpose it was intended, whether or not you received a specific written or verbal (express) warranty, you should be entitled to a refund. This protection comes under the "implied warranty of merchantability," which guarantees that a product sold to you will work for its intended purposes. "Unfit" is open to interpretation, but might include a cracked dish, damaged clothing, a toaster that doesn't toast or a ball that doesn't bounce. Deciding you'd prefer a red ball rather than the blue one you bought is not covered. However, if a merchant's description of an item is clearly inaccurate, you might have cause to demand a refund. Learn more about all types of warranties at the Federal Trade Commission (FTC) website. Learn more about implied warranties (warranty of merchantability) at the FindLaw website. Implied warranties are created by state law, and all states have them. Contact your state's consumer protection office for information. Unless a product purchased is found to be unfit for the purpose for which it was intended, there's no federal law that requires a merchant to refund money—the policy around refunds is up to the merchant, providing it meets minimum state legal requirements regarding disclosure. Generally speaking, regardless of the actual terms of the return policy, it must be prominently displayed where purchases are made—that includes websites—for it to be considered valid. If the return policy is not displayed, some states have laws that allow consumers to make returns and get refunds for a certain number of days after the purchase is made. While many states have laws on the books that address consumer refunds (see the full list on FindLaw's website), not all of them apply to online purchases made across state lines. If you have a question about your particular state's refund laws, contact your state's consumer protection office. Should I check one of the many promo code websites before making my online purchase? Whether you call them coupon codes, promo codes or discount codes, these codes, which you enter during online checkout, save you money. They typically entitle you to a percentage off your purchase total and/or free shipping. Often, you can find promo codes displayed right at the top of the merchant's website while you are shopping. But sometimes merchants don't make their promo codes so easy to find. For that reason, many shoppers check elsewhere for promo codes before checking out, usually by doing an online search for the name of the brand or merchant plus the words "promo code" or "discount code" or "coupon." There are many legitimate websites devoted solely to providing active promo codes, but there are also some scammers who lure consumers to their websites with promises of great discounts. To avoid the fakes, it's best to search only reputable promo code sources. These include such sites as RetailMeNot.com, Slickdeals.net and Offers.com. You can also contact the merchant to ask about its current promotions. How can my payment method protect me if I'm dissatisfied with my purchase? Cash equivalent: This isn't a typical option for online shoppers, but if you are offered the possibility—or requirement—to pay by cash, check, prepaid card account code or other cash equivalent, think twice about going through with the purchase. These payment methods offer no protections or dispute rights, and a request for cash (or the equivalent) is often the sign of a scam. Credit card: A credit card is your most secure form of online payment. First, transactions are paid using the card issuer's money, not yours, so fraudulent or disputed transactions do not draw money out of your bank account. Second, your liability for unauthorized transactions is limited to $50, and may be nothing if the issuer has a zero-liability policy. Third, if you have a problem with a purchase, you can dispute the transaction with the card issuer and withhold payment while the issue is being investigated. Depending on your card, you might have other benefits, such as extended warranties on your purchases. Debit card: While a debit card with a Visa or MasterCard logo may offer you some similar dispute rights to those of a credit card, it also carries a major risk: It is tied directly to your checking account. That means that the money for transactions—both legitimate and fraudulent—comes right out of your account. Even if you report a problematic transaction, you could be out that money for as long as 10 business days (20 on very new accounts), while the bank investigates. And that could make it difficult or impossible to pay your bills and living expenses. With a debit card, you have no liability for unauthorized transactions involving just the card number (rather than the actual card) as long as you report them within 60 days of receiving the statement reflecting the unauthorized use. However, you could be liable for any transactions that occur after 60 days following the mailing of your account statement and before you report the loss. Prepaid card: Despite efforts to improve prepaid card protections, there are no federal laws or regulations to protect general purpose prepaid card users the way credit and debit card users are protected. However, the prepaid card you choose may voluntarily offer some similar consumer protections. Since prepaid card consumer protections are voluntary, any that are offered could be rescinded at any time. Check your card issuer’s policies. Since a prepaid card can’t be used until you “load” it with funds, any unrecoverable losses would be of your own money. See Consumer Action’s A consumer’s guide to choosing a prepaid card to learn what policies and protections to look for before choosing a prepaid card. Payment platform: Any consumer protections offered by intermediary payment services (PayPal or Google Checkout, for example) are voluntary. That doesn’t mean the company won’t stick by its promises, just that you should check the company’s policies first and understand that they could change. However, using a credit card to make a payment through your PayPal or similar type of account (rather than another type of card or the cash balance held inside your account) offers you all the consumer protections required by law for credit card holders. What are some examples of common customer service issues or disputes, and how are they usually resolved? Some common online shopping problems include never receiving the item(s) ordered, receiving defective or damaged merchandise, being charged more than expected, receiving the delivery later than expected, finding out the price has dropped since you placed your order, and being dissatisfied with the quality or appearance of the item(s) ordered. In many, if not most, cases, these issues should be resolvable directly with the merchant. Resolutions might include things like paid return shipping, a full refund, a price adjustment, or crediting the customer the amount of money it costs him/her to have the item repaired. How the merchant decides to resolve the issue voluntarily depends on, among other considerations, posted return/exchange/refund policies, customer service philosophy and cost effectiveness (for example, it might be worth it for the merchant to credit a consumer the $30 it costs to replace a broken glass table-top rather than lose a large sale or have to pay for round-trip exchange shipping). For tips on getting your complaint heard and successfully resolved, read Consumer Action's "How to Complain" guide. The problem may not be easily resolved if, for example, the merchant says you waited too long to lodge your complaint, the merchant will only offer store credit rather than the refund you expect, the merchant will not pay return shipping charges even under extenuating circumstances, the merchant says you should have known about any additional cost/charges, the merchant says any damage must have occurred during delivery or after receipt, or the merchant says it is not its fault the shipping company delivered your parcel too late. If you can't make progress on your own, this is when a third party—a mediator—might be able to help. It's possible that the mediator can offer suggestions for a reasonable resolution based on experience with many similar cases. If even the mediator can't reach a resolution, and you still think you have a case, then you may have to file a dispute with your credit card issuer (or other payment source/platform). However, doing so is not a guarantee that the case will be decided in your favor. If the card issuer/payment platform decides in favor of the merchant, the transaction will remain on your account. Return fraud refers to the act of defrauding a merchant using the merchandise returns process. Most types of return fraud are committed in brick-and-mortar stores, using shoplifted merchandise and/or bogus receipts. But online return fraud can be committed too, by, for example, buying merchandise with the intention of wearing or using it and then returning it. To combat return fraud, some merchants use an online database that tracks consumers' returns at participating retailers. If your return or exchange was denied or you were warned about excessive returns, your name might be in the Retail Equation database. You can request a free copy of your Return Activity Report, if one exists. What is "friendly fraud"? "Chargeback fraud"? Friendly fraud—a rather consumer-unfriendly and arguably inaccurate description—refers to chargebacks initiated by consumers who are mistaken about the legitimacy of a transaction. For example, they might have forgotten they made the transaction, they might not be aware that someone else in their household made the transaction, they might not recognize the merchant's name on the billing statement, or they might have unintentionally signed up for recurring billing. Unlike friendly fraud, chargeback fraud is the act of purposely defrauding a merchant by making an online purchase and then reporting the merchandise as undelivered (after you have received it) and requesting a chargeback from the payment card issuer (or PayPal, etc.). Can friendly fraud disputes be held against a consumer? Any merchant has the right to refuse to do business with a particular consumer. Most merchants will overlook one or more instances of friendly fraud, but they might blacklist you—revoke your right to purchase from them—if you exceed their limit. It's also possible that the card issuer (or PayPal, etc.) could cancel your account if it felt that you were abusing the chargeback/dispute process or committing fraud. Having said that, you should never hesitate to exercise your dispute rights in the case of fraud or a valid issue that you have been unable to resolve with the merchant. What is the typical mediation process? Mediation is a form of "alternative dispute resolution" in which a neutral third party helps the other parties reach a voluntary resolution. The process can vary from service to service, but it generally entails you submitting a claim, the mediator contacting the merchant to notify it of your issue and your desired result, and an attempt to negotiate a resolution. Sometimes having a third party involved allows the two sides to look at the problem more objectively and to avoid heated interactions that might cloud their judgment. That doesn't mean that all mediated disputes are resolved; some might end up as a chargeback, a court case or simply a dissatisfied customer or merchant. For consumers who want to do it themselves, Consumer Action's "How to Complain" guide offers information and tips on how to get results, and includes sample complaint letters that you can edit to meet your needs, as well as additional tips and resources for finding outside assistance. What can I do if I'm unable to satisfactorily resolve my dispute through mediation? If you and the merchant can't reach an agreement through a mediator, you might find resolution through a local or state consumer protection office or through the payment processor's dispute process. If the matter is decided in the merchant's favor and you still want to pursue your case, you could consider going to court. If you believe that you were treated unfairly in a credit card dispute that you lost, you could file a complaint against the card issuer with the Consumer Financial Protection Bureau (CFPB). What is the typical dispute process? If you can't reach a satisfactory resolution directly with the merchant or by using a mediator's services, you can dispute the transaction with the card issuer. The process may vary somewhat, but typically you begin by contacting the card issuer or payment platform and saying you want to dispute a transaction. You may have the option to do this by phone, online and/or in writing (a letter mailed to the card issuer at its "billing inquiries" address). In most cases, the company contacts the seller and investigates the transaction. If it decides in your favor, the transaction will be removed from your account permanently. The Fair Credit Billing Act (FCBA) requires credit card issuers to respond to your dispute in writing within 30 days, and complete their investigation and resolve the issue within two billing cycles or 90 days, whichever is sooner. If the card issuer decides in your favor, it is required to give you a written explanation of the adjustment it has made and to delete both the charge and any interest and fees that went with it. It's also required to send you a written statement regarding its decision if it decides in the merchant's favor. The National Consumer Law Center offers a fact sheet explaining your credit card rights. Where can I find mediators to help me with my complaint? You might have choices when it comes to mediation services. First, if you made your purchase through an online auction site such as eBay, you might have the option to use the service's own dispute resolution process. Likewise, PayPal offers a dispute resolution process for customers who make payment through the platform. Exact processes vary, so check websites for details. There are also third-party online dispute resolution (mediation) services that you, the consumer, can contact directly for help sorting out a problem with a merchant. One such service is eConsumer Services, the company that sponsored the creation of this Q&A and related educational materials. You might be able to find other mediation services by doing a web search for key phrases such as "online merchant mediation" or "online dispute resolution." Cost is determined by the service. For example, eConsumer Services provides its services for free if you shopped with one of their "endorsed" merchants, and charges $2.00 if you shopped with a merchant not on their list and the process takes more than 24 hours to complete. What if I'm dissatisfied with the outcome of my complaints, dispute(s) and/or mediation? If you can't get satisfactory resolution to your problem through mediation and/or the dispute process, you can contact your local or state consumer protection office, which takes complaints and might provide mediation services of their own. They also should be able to inform you of your rights, which could help you determine whether or not to continue to pursue the issue. If you still think you have a strong case, you might consider going to court. Where can I find a consumer attorney? The Legal Services Corporation is a non-profit that provides financial support for civil legal aid to low-income Americans. Eligible clients include the working poor, veterans and military families, homeowners and renters, families with children, farmers, the disabled, and the elderly. Find a local legal aid organization at Legal Services Corporations website. The National Association of Consumer Advocates (NACA) database allows you to search for attorneys by area of legal specialty and state. The FindLaw database allows you to search for a consumer law attorney by state, city and some other criteria. The tips offered in the State Bar of California's "Finding the Right Lawyer" guide can help consumers choose an attorney regardless of what state they live in. The American Bar Association (ABA) offers a similar resource. Where can I learn about my state's internet privacy laws? One place to look is the National Conference of State Legislatures website. You can also contact your state attorney general's office directly. Find information at the National Association of Attorneys General website.